sive. 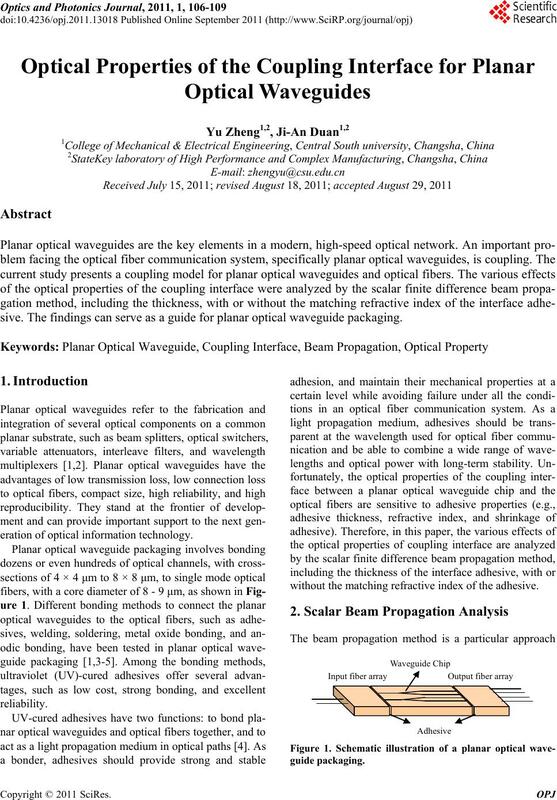 The findings can serve as a guide for planar optical waveguide packaging. eration of optical information technology. 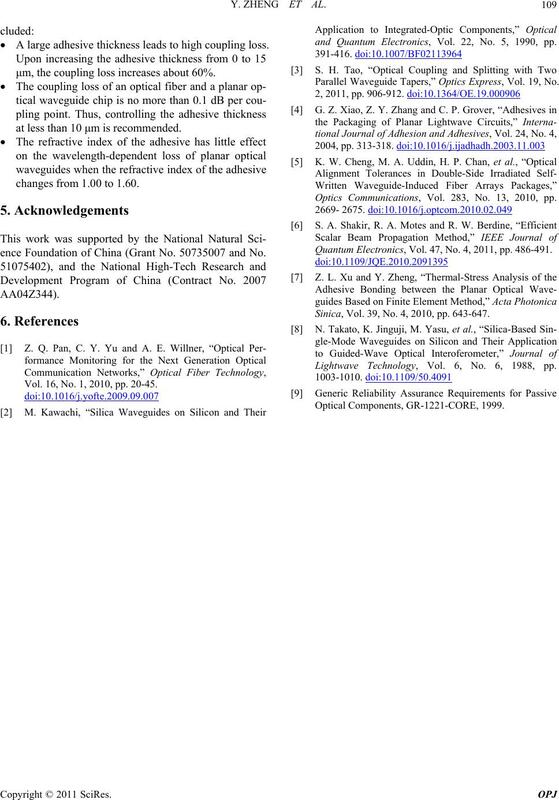 without the matching refractive index of the adhesive. sity of the first and the second media, respectively. larly to that of signal attenuation through a waveguide. before and after the joint, respectively. the optical fiber and the planar optical waveguide chip. 1.31 and 1.55 μm (optical communication wavelength). the slope of the variation is small. adhesive. (a) λ = 1.31 μm; (b) λ = 1.55 μm. ness d = 9 μm. fractive index of the adhesive changes from 1.00 to 1.60. 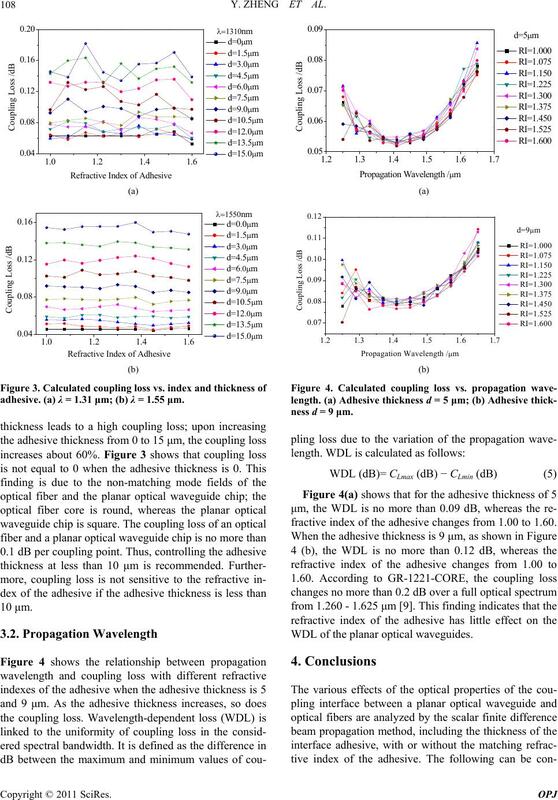 WDL of the planar optical waveguides.  A large adhesive thickness leads to high coupling loss. μm, the coupling loss increases about 60%. at less than 10 μm is recommended. changes from 1.00 to 1.60.
ence Foundation of China (Grant No. 50735007 and No. Vol. 16, No. 1, 2010, pp. 20-45.
and Quantum Electronics, Vol. 22, No. 5, 1990, pp. 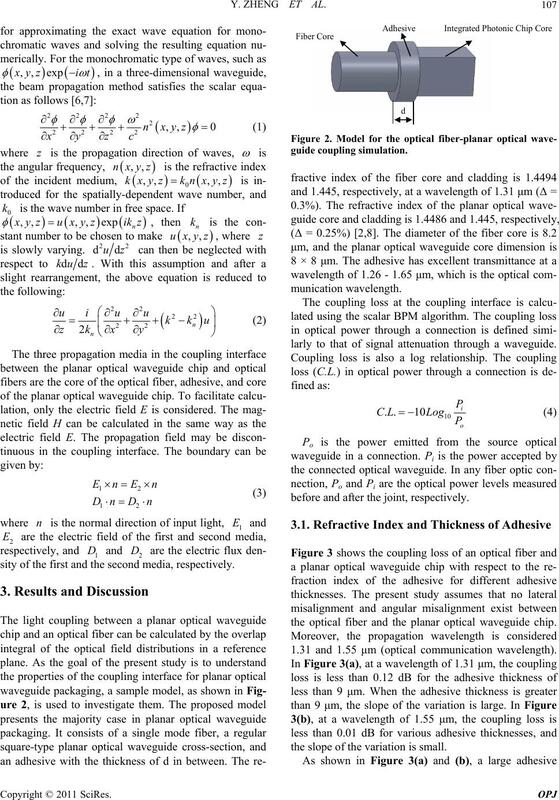 Parallel Waveguide Tapers,” Optics Express, Vol. 19, No. Optics Communications, Vol. 283, No. 13, 2010, pp. Quantum Electronics, Vol. 47, No. 4, 2011, pp. 486-491. Sinica, Vol. 39, No. 4, 2010, pp. 643-647. Lightwave Technology, Vol. 6, No. 6, 1988, pp.